Germany, the bloc's biggest economy and energy market, goes to the polls later this month and afterwards must reform its energy laws reflecting a costly low-carbon approach coupled with scepticism about fossil fuel production, including fracking. "I advise you to keep all [gas fracking] options open … that make [Russian leader Vladimir] Putin nervous," he said. Oettinger, a German national, was alluding to unresolved differences in European fracking laws which leave shale gas output dormant despite its potential, while gas imports are rising, with Russia remaining the biggest single supplier. Due to environmental concerns, Berlin has suspended plans to regulate hydraulic fracking until after September's election, prolonging the uncertainty that curbs its development. Fracking, which involves pumping water and chemicals at high pressure thousands of metres below the ground to release gas, has helped lower energy prices in the United States, fuelling an industrial revival. Oettinger said German industry could afford to pay 50% or 100% more for energy than rivals in the United States, "but not more than that". 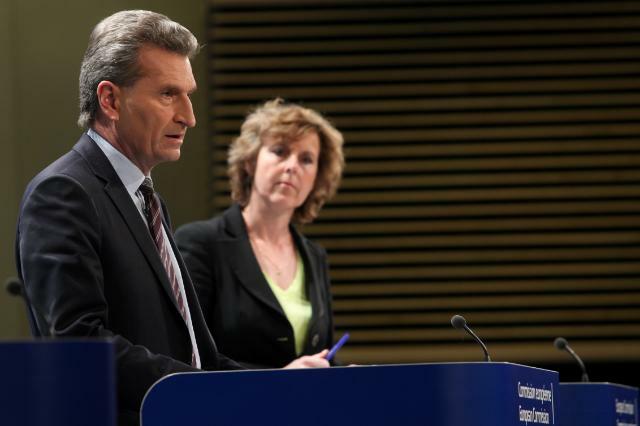 Oettinger defended exemptions that Germany grants its industry from energy-related costs. They have come into the focus of an EU probe as neighbours and private German consumer groups complained about alleged distortions to competition. "If industry wants to survive, it needs [energy cost] exemptions," Oettinger said. He called German Green Party ideas for further industry regulation "adventurous" and warned that industrial players could leave Europe to relocate elsewhere. Turning to current EU climate policies, Oettinger warned that the bloc risked investing in too many ideas and research while it only accounts for a small part of global emissions. The European Commission is due to propose 2030 climate protection goals later this year. Oettinger advised caution. "It is becoming increasingly questionable whether our pioneering activities can be financed when the rest of the world does not follow suit," he said. In March 2013, the European Commission issued a Green Paper that sketches out new 2030 targets for cutting greenhouse gas emissions and using clean energy, designed to keep the EU at the forefront of global efforts to combat climate change. The Commission's Green Paper launches a public consultation that marks the first step towards creating a 2030 framework for EU climate change and energy policies. The new framework must take into account the consequences of the economic crisis, but it must also be ambitious enough to meet the necessary long-term goal of cutting emissions 80-95% by 2050, the Commission said. The bloc currently has three 2020 climate policy goals: to cut carbon emissions by 20% compared with 1990 levels, increase renewables to 20% and improve energy savings by 20%. EURACTIV Turkey: Oettinger'den Almanya'ya 'kaya gaz?na ?ans verin', AB'ye 'iklim i?ini abartmay?n' ça?r?s? “I advise you to keep all [gas fracking] options open … that make [Russian leader Vladimir] Putin nervous,” he said. If independence from Russian gas is the only reason why we need to consider fracking, I’m afraid the Commissioner needs to try a little harder! One clearly sees that Oettinger is still a member of the fossil fuel loving party in Germany. Here he is just running an election campaign for the conservatives! Even Germany would collapse if it had to rely 100% on renewables. Good to see there are a few clear headed people left in Germany who haven’t joined the cult of global warmism. The answer to which is give up trying, consume as much as we can while there’s still anything left to consume? Never mind that the argument that fracking in Europe (with more expensive to extract deposits and far greater population density) will result in the same price reductions as in the US is completely flawed. Among other misconceptions (I’ll be kind and not call them outright lies) such as the oft-repeated claim that fracking has never been proven to poison groundwater or aquifers. It certainly has in the US, but compensation claim settlements come with gag orders, so getting official documentary evidence is difficult. Plenty of anecdotal, informal, video, and other kinds of evidence around, however. I think Günther Oettinger needs to start looking for a new job because he’s clearly in the pockets of big oil & gas. Resign now, Oetty, before you’re pushed! The original reason for moving to renewables, namely CO2 reduction, has been overtaken by events. Global temperatures have remained level for the past sixteen years, all the while that atmospheric CO2 has increased, disproving the greenhouse hypothesis. The climate computer models in which so much has been invested, all failed to predict the temperature stasis. There is therefore no logical purpose in ‘decarbonisation’. The installed base of intermittent renewables has done nothing to remove the need for reliable conventional power sources, and has only increased the cost of electricity and despoiled the environment with intrusive windfarms. In view of this, it is therefore obtuse to oppose the development of shale gas. At the least, we should be finding out how much gas can be usefully exploited, and how to utilise this valuable resource in the same way that the USA has achieved. The fundamental question is whether Europe wants to stay on a totally irrational course that ultimately hits its competitiveness (and growth and jobs, especially for the young generation) or if we can get beyond the debate of faith. However, this would mean an exchange of arguments – not of insinuations and denigration.. Whoever does not agree with the renewable promoters is accused of being bought by the fossil fuel industry. This is total rubbish. It assumes that people cannot think for themselves and cannot take a responsible position which may be different then the ecological mainstream. Not to take a close look into the possibilities of shale gas in Europe would mean to continue on an irrational path – the research will show if and how it can be extracted.